TamilNet: With United National Front (UNF), Sri Lanka enjoyed 2 years of peace. What is the real reason behind Ms.Kumaratunge taking over the ministries and sacking the government? Is it for selfish reasons..or was Ms.Kumaratunge genuinely worried about LTTE gaining upper-hand and ultimately secede? Dr.Karunarathne: Chandrika came under the pressure of JVP and other Sinhala racist forces who indicated an "easy" way to consolidate her power. There is a capitalist need for a strong government which can resist both the Tamil liberation and worker struggles. TamilNet: What are the chances of SLFP-JVP alliance getting absolute majority in the 2 April elections? Dr.Karunarathne: With Buddhist Monks contesting separately, openly proposing "Sinhala Buddhist" dictatorship, it is very unlikely that United Peoples Freedom Alliance (UPFA) could become first in any of the districts. In any case forces for peace and democracy are also very strong. TamilNet: If UNF forms a government, do you think Ms.Kumaratunge, as President, will try to again interfere with the UNF in the peace process? Dr.Karunarathne: Chandrika is very unpredictable. She could form a coalition government with Ranil even if she wins. She does not want to go into history merely as an obstacle to peace. TamilNet: How does NSSP intend to participate effectively in the election process? Do you think the instability in the southern polity will lead to more support for parties like NSSP? Dr.Karunarathne: We are contesting all 22 districts as the New Left Front. Certainly we could do better this time. Already we see many new faces in our campaign. TamilNet: Why have CP/LSSP joined the UPFA? 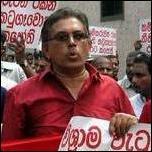 Dr.Karunarathne: What can the CP/LSSP leaders do except to continue their combination with the SLFP leadership. Which they seem to me as the lesser evil. TamilNet: Monks involvement has added a new dimension to Southern politics? Is this likely to weaken JVP-SLFP alliance? Dr.Karunarathne: Monks were always involved in politics of Sri Lanka. Even during ancient Anuradhapura days. This is the first time monks came out on a chauvinistic ticket. Already UPFA leaders are jittery about the Monks. TamilNet: If TNA wins a large number of seats will that be a significant event like the Vaddukoddai resolution? Can LTTE then claim that they are the sole representatives of Tamils? Dr.Karunarathne: LTTE has the support all Tamil parties except the EPDP. In that sense they can claim that they represent the Tamil Nation. Even after the election situation will remain the same unless the EPDP gains many seats. This is very unlikely. TamilNet: What is the future of parties like EPDP then? Dr.Karunarathne: EPDP will survive until the democracy is established in the autonomous Tamil homeland. They are foolishly seeking democracy at the expense of liberation. They have failed to see what is necessary and what is contingent in the present context. Tamil speaking people will give them the answer.